In Russ Rymer’s nearly brilliant debut novel Paris Twilight, 50-year-old American cardiac anesthesiologist and adoptee Mathilde Anselm describes how she came to Paris in 1990 in the months leading up to the first Gulf War, when the city was congested with huge anti-war demonstrations, to participate in a semi-secret heart transplant operation in a private hospital. Then she begins falling in love with her patient Odile Sahran’s wealthy brother Emil, a fifth generation French citizen, businessman, and diplomat of Arab ancestry. Following this she unexpectedly inherits a legacy that includes a studio apartment in a posh Parisian neighborhood from Byron Saxe, a man she’s never heard of, along with the correspondence of a Spanish Republican married couple—the husband, Carlos Landers, a refugee in France in the final months of the Spanish Civil War, and his wife Alba who was in Spain with the retreating Republican forces—which Mathilde is recruited to help American professional translator and political activist Corrie Bingham translate. And all of this is narrated in gorgeous, elegiac prose denser than the previous three paragraphs, addressed to Daniel, the love of her life who died in Vietnam in 1964. In addition to the characters mentioned above the city of Paris is also a character. 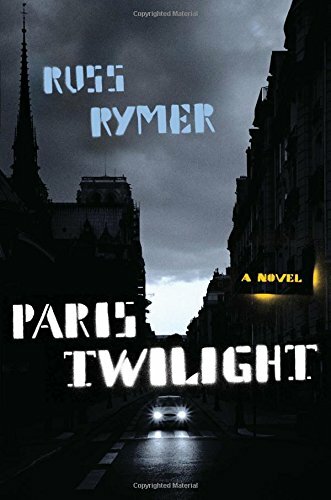 Paris Twilight succeeds not just because of the beauty of its prose but also because of its complex plot and the way Mr. Rymer pulls the disparate storylines together in the end. But that success is slightly diminished by a few implausible plot elements. One such element is that Matilde’s former surgical partner of many years Willem Madsen—a cardiac surgeon whose last operation with her landed him and Mathilde in court as opposing litigants—was able to convince her to let bygones be bygones and come to Paris to participate in a semi-clandestine heart operation. We learn that under the best of circumstances surgeons and anesthesiologists work at cross-purposes: surgeons invade and change the body, while anesthesiologists try to keep it stable and status quo. Mr. Rymer waits until page 60 to have Mathilde question whether the donor heart will be acquired ethically. The other minor flaws cannot be revealed without spoiling an otherwise very enjoyable and strongly recommended read. Readers who enjoy that kind of dense, stream of consciousness writing will probably enjoy this novel. Those for whom the text quoted above is a run-on sentence probably won’t. Mr. Rymer’s use of figurative language sometimes approaches but never quite crosses the line into purple prose. Paris Twilight is a novel rich not only in language, characters, and storylines traversing multiple decades, but one that addresses difficult questions about ethics, love, friendship, family, suicide, and history, and does not shy away from scientific references to anatomy and physiology. In Mathilde Mr. Rymer inhabits and convincingly animates a psychologically complex and multidimensional female sensibility as well or better than more experienced male fiction writers. At the end of the novel she is enriched and bereft, still wounded and yet made whole. This is Mr. Rymer’s third book and his first work of fiction. His first book was nominated for the National Book Critics Circle nonfiction award. Paris Twilight deserves to be nominated in the fiction category of book prize competitions.